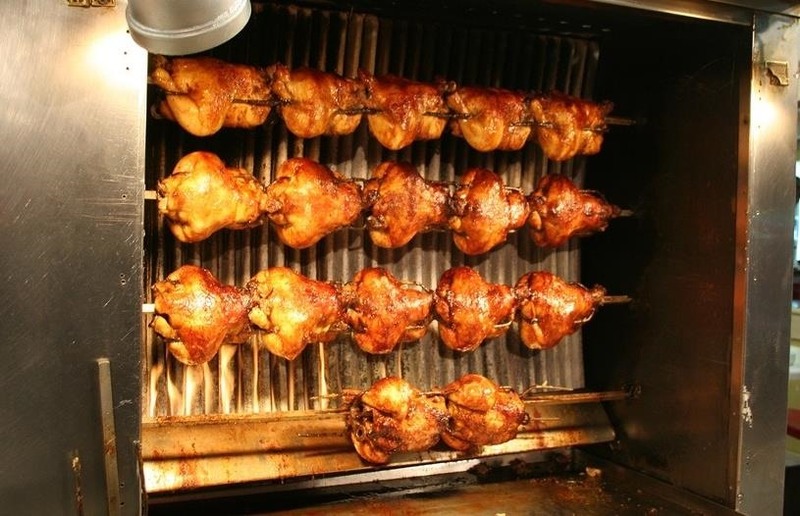 Nothing makes my stomach growl and my mouth water quite like the smell of roasting chicken. It's a pretty universal reaction, too—there's a reason every grocery store places its rotisserie grills and delis near the entrance, after all. The appeal of the grocery rotisserie chicken is the gorgeous color and crisp skin that only meticulous roasting over a spit can provide. None of us have the time nor the resources to roast chicken this way, and so it makes sense to buy rotisserie chicken instead of making it ourselves. Various kitchen appliances, pots, and pans have been created in an attempt to recreate the even cooking that rotisseries provide. My "favorite" is the All-Clad Ultimate Chicken Roaster. It's no longer on the market, but its ridiculous design and utter uselessness for any other practical application will live on in my heart forever. On a more serious note, the Staub Cast-Iron Vertical Chicken Roaster is a round cast-iron pan with a vertical spike at its center. 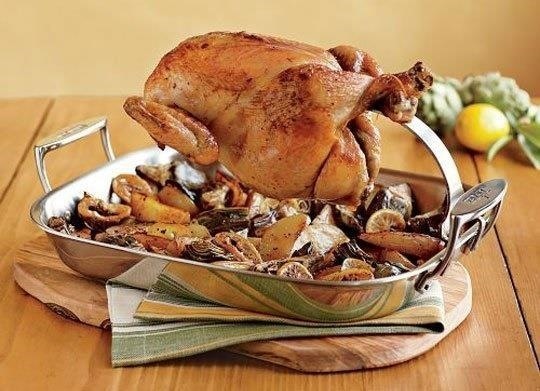 Staub claims that this spike promotes even cooking by roasting the bird upright; by eliminating the need for turning the chicken halfway through roasting, the meat not only cooks evenly, but the skin also maintains all-around crispness. I'm not encouraging anyone to spend $99.00 on a one-trick pony, though: surely we all have more than enough appliances, pots, and pans in our kitchens. Instead, I'm going to tell you to use something that you probably have, but only use once or twice a year at most: a bundt pan. 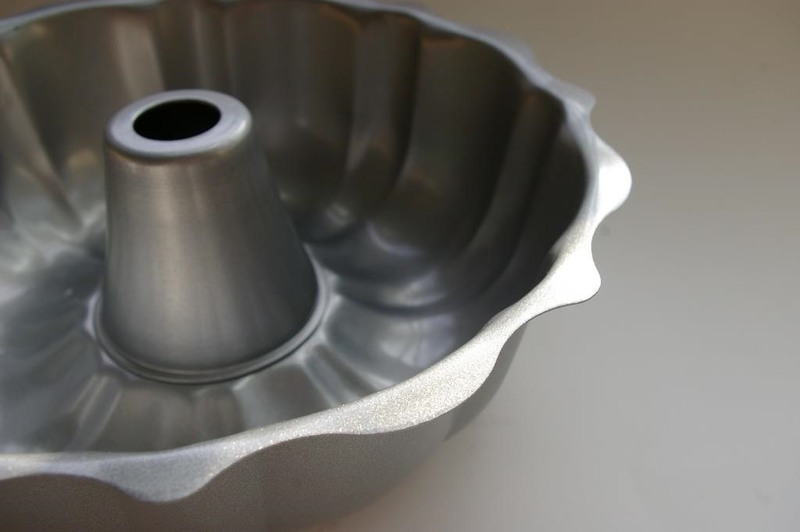 Like the vertical roaster, the bundt pan has a raised center that can prop the chicken vertically while roasting in the oven. 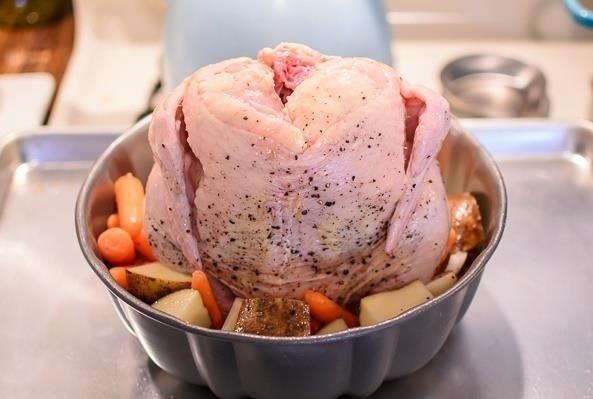 And because its sides are higher, the bundt pan can also fit a larger amount of vegetables and bread around the chicken to catch the drippings. Season the chicken as you prefer—I like to rub salt and pepper on the skin, then a compound butter made with garlic and rosemary under the skin. 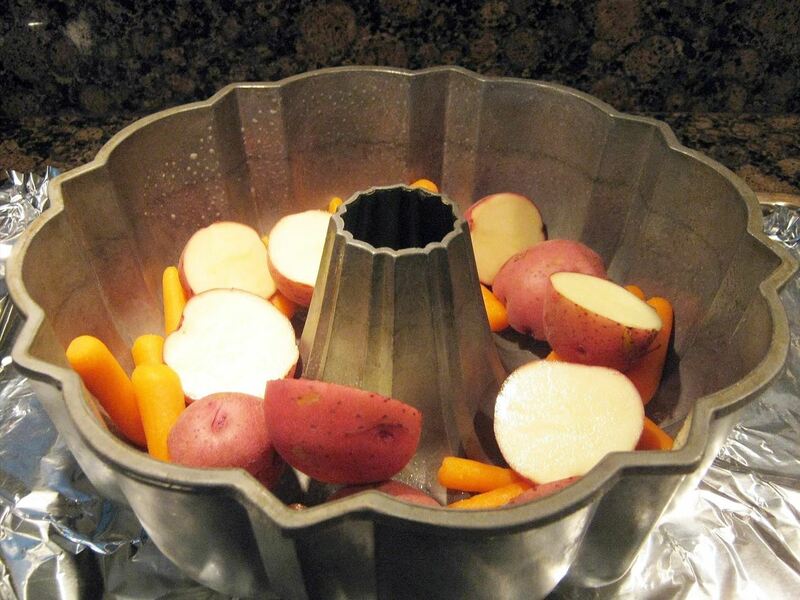 If you'd like to include vegetables, add them to the bottom of the bundt pan. Roast for 50-60 minutes or until the thigh temperature reaches 160°F. 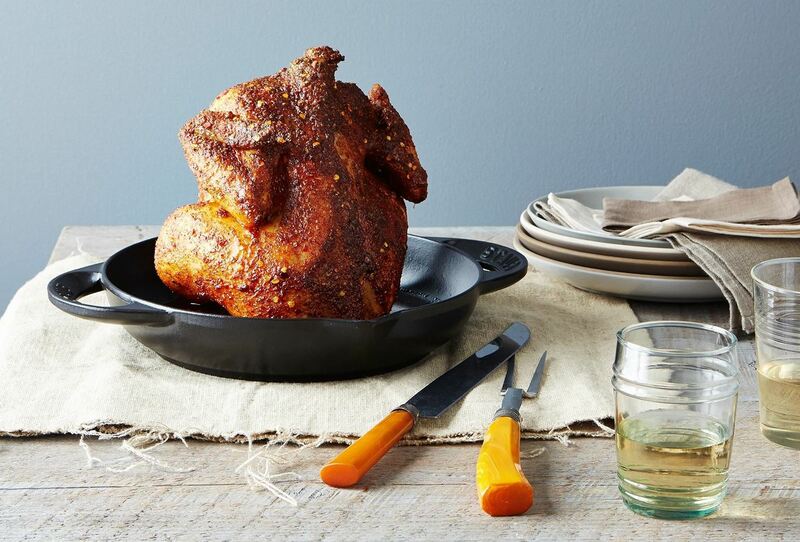 This roast chicken hack is not only easy, it's also cost-effective: bundt pans cost as little as $10.00 on Amazon, if you don't have one already. 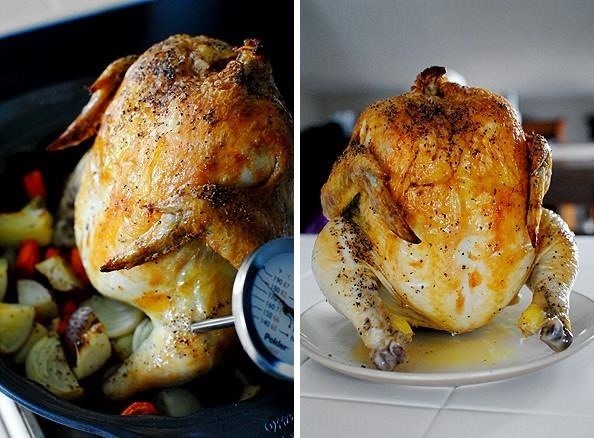 Now that you know an easy way to make rotisserie chicken at home, stop buying them at the grocery store and start roasting chicken yourself! Not only will you be able to adjust the seasonings to your preferences, but you won't have to purchase a side dish separately anymore—you can roast it with the chicken at the same time. For those of you that don't have a bundt pan and don't see the point in buying one, either... you can still vertically roast your chicken using a beer can in a roasting pan, which is arguably more fun than using a bundt pan (if not less practical). You could also use your grill. If you don't particularly like the idea of using a beer can, you can buy cheap roasters like this or this that work similarly. Happy roasting!